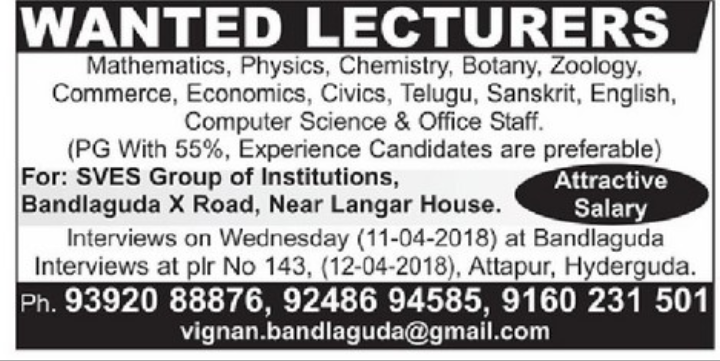 SVES Group of Institutions, Hyderabad has advertised in THE Eenadu newspaper for recruitment of Lecturer job vacancies. Interested and eligible job aspirants are requested to apply immediately and attend interview. Check out further more details below. Name of the College : SVES Group of Institutions, Hyderabad. About College: SVES Group of Institutions is one of the famous educational group in Bandlaguda. PG with 55%, Experience candidates are preferable. 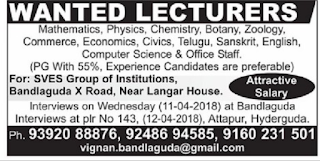 How to Apply: Interested candidates are requested to attend interview on wednesday (11-04-2018) at Bandlaguda. Interview at plr no 143, (12-04-2018), Attapur, Hyderguda.